India’s Ministry of Finance recently released a whopper of an annual Economic Survey. Don’t let the boring title fool you: this is a magnum opus on contemporary development. (Full disclosure: the lead author is Chief Economic Advisor Arvind Subramanian, a friend and senior fellow on leave from CGD.) The Survey contains the usual detailed analysis of the Indian economy. Yet the parts of most interest to developmentistas are likely to be the special chapters on demonetization, low-skill manufacturing, fertility puzzles, urbanization, and more. “Universal Basic Income: A Conversation With and Within the Mahatma” (Chapter 9) is the one that really caught my attention. 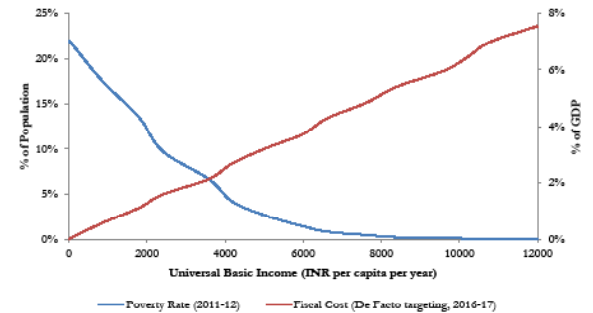 It’s a thoughtful, cogent, and thorough discussion of the potential to replace India’s vast complex of subsidies and targeted in-kind benefits to the poor with a guaranteed cash transfer to all citizens. The idea of UBI is simple: instead of providing subsidies for fuel, free meals, and dozens of other welfare benefits, just deposit money directly into the bank account of every citizen to use as they see fit. For followers of CGD’s Oil-to-Cash initiative, the survey also highlights the fascinating case of the state of Goa (page 297), where a 2012 judgement by the Supreme Court of India created the Goa Iron Ore Permanent Fund. A group of citizens, the Goenchi Mati Movement, are now fighting for the expansion of the fund and the distribution of cash dividends, akin to the Alaska Permanent Fund dividend, which pays out an equal share of half the five-year average earnings from the state’s sovereign wealth fund to each resident. Or so one might tentatively infer.